U.S. Marshals and Cleveland police found the two girls reporting missing Thursday afternoon at the home of their grandmother, along with the girls' mother, who was arrested. CLEVELAND — U.S. Marshals and Cleveland police found the two girls reporting missing Thursday afternoon at the home of their grandmother, along with the girls' mother, who was arrested. Police said the girls were taken by their mother Wednesday from Fairview Park. Caryann Sewell and her daughters, aged 2 and 4, were found at the home of the girls' grandmother in Cleveland on Arrowhead Avenue on the East Side. Police said the girls and Sewell were found hiding behind a couch in the home. “The kids were well behaved. They were quiet. She was fine. Other than hiding, they were completely cooperative," said US Marshal Bill Bolden. 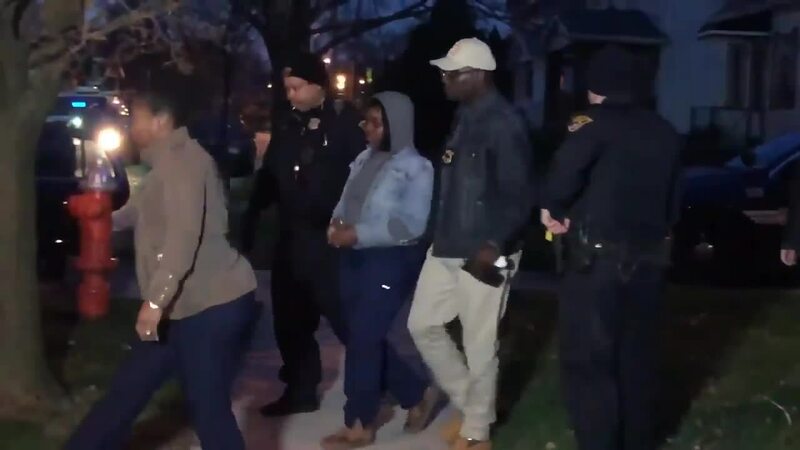 According to Cleveland police, Sewell was ordered by the court to turn her two girls over to the Cuyahoga County Division of Children and Family Services. However, on Monday, police said Sewell took the girls from daycare in violation of the court order. A Euclid police officer came into contact with Sewell, who allegedly told the officer that the girls were "out of town" before abruptly ending the conversation, according to a police report. Two days later, on Wednesday, Fairview Park police officers were called to a nursing home near city hall in reference to two children who had been in a car for an extended period of time. Authorities said they located the driver, later identified to be Sewell, but she gave them a fake identification card. Authorities also believe she used the fake identity when applying for a job at the nursing home, which she had previously been fired from at a different location. Suspecting that the woman’s driver’s license was not Sewell’s, police used a fingerprint reader in hopes of learning her true identity. While confirming her identity and that he had five active warrants for her arrest, police said Sewell hopped back into her vehicle before slamming into a police cruiser. Sewell then crossed a landscaping median in the parking lot, drove over the sidewalk and then drove through a neighbor’s yard before speeding away. Police said the children were still in the vehicle. Authorities later learned that Sewell also allegedly had stolen license plates on her vehicle. The responding officers briefly chased Sewell’s vehicle, but Lt. Shepherd said he quickly terminated the pursuit because of the potential safety risk to Sewell, her children and the general public. Sewell was driving at speeds eclipsing 60 mph in a 25 mph zone when the pursuit was terminated, Lt. Shepherd said. Her vehicle was later found abandoned. On Thursday evening, Sewell was found at her mother’s home with her two daughters. Over a dozen U.S. Marshals and Cleveland police officer set up a scene outside the home. At about 7:45 p.m., Sewell was taken into custody, and her two daughters were taken by police safe, unharmed and clean, according to US Marshals. Officers contacted Children and Family Services, a Cleveland police official said. “This is a win. This is a happy ending," Bolden said. News 5 will continue to update this story as more information becomes available.